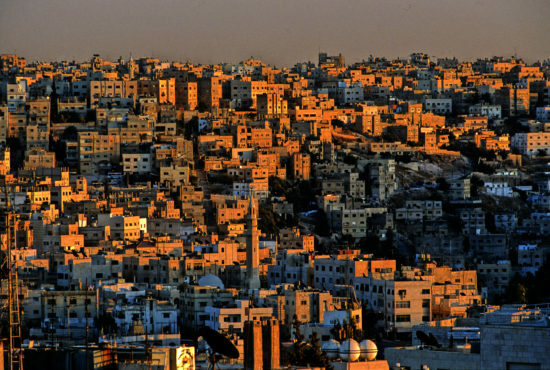 Amman is the capital and most populous city of Jordan, and the country’s economic, political and cultural centre. Situated in north-central Jordan, Amman is the administrative centre of the Amman Governorate. The city has a population of 4,007,526 and a land area of 1,680 square kilometres. Today, Amman is considered to be among the most liberal and westernized Arab cities. It is a major tourist destination in the region, particularly among Arab and European tourists. The earliest evidence of settlement in the area is a Neolithic site known as ‘Ain Ghazal. Its successor was known as «Rabbath Ammon», which was the capital of the Ammonites, then as «Philadelphia», and finally as Amman. It was initially built on seven hills but now spans over 19 hills combining 27 districts, which are administered by the Greater Amman Municipality headed by its mayor Aqel Biltaji. Areas of Amman have either gained their names from the hills or valleys they lie on, such as Jabal Lweibdeh and Wadi Abdoun. East Amman is predominantly filled with historic sites that frequently host cultural activities, while West Amman is more modern and serves as the economic center of the city. 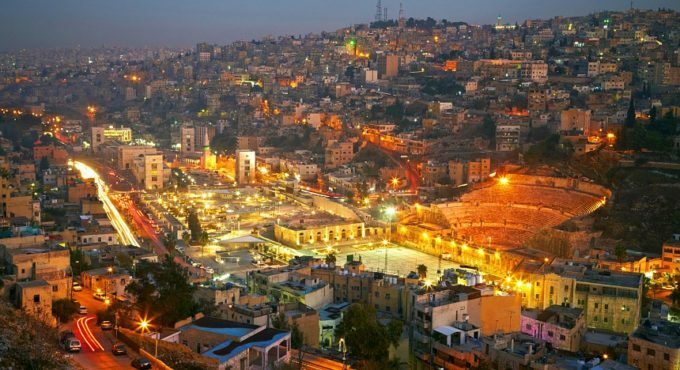 Approximately 2 million visitors arrived in Amman in 2014, which ranked it as the 93rd most visited city in the world and the 5th most visited Arab city. Amman has a relatively fast growing economy, and it is ranked Beta− on the global city index. Moreover, it was named one of the Middle East and North Africa’s best cities according to economic, labor, environmental, and socio-cultural factors. The city is among the most popular locations in the Arab world for multinational corporations to set up their regional offices, alongside Doha and only behind Dubai. It is expected that in the next 10 years these three cities will capture the largest share of multinational corporation activity in the region. Amman derives its name from the 13th century BC when the Ammonites named it «Rabbath Ammon», with the term Rabbath meaning the «Capital» or the «King’s Quarters». Over time, the term «Rabbath» was no longer used and the city became known as «Ammon». The influence of new civilizations that conquered the city gradually changed its name to «Amman». In the Hebrew Bible, it is referred to as «Rabbat ʿAmmon». However, Ptolemy II Philadelphus, the Macedonian ruler of the Ptolemaic Kingdom who reigned from 283 to 246 BC, renamed the city to «Philadelphia» after occupying it. The name was given as an adulation to his own nickname, Philadelphus. Amman is situated on the East Bank Plateau, an upland characterized by three major wadis which run through it. Originally, the city had been built on seven hills. Amman’s terrain is typified by its mountains. The most important areas in the city are named after the hills or mountains they lie on. The area’s elevation ranges from 700 to 1,100 m (2,300 to 3,600 ft). Al-Salt and al-Zarqa are located to the northwest and northeast, respectively, Madaba is located to the west and al-Karak and Ma’an are to Amman’s southwest and southeast, respectively. One of the only remaining springs in Amman now supplies the Zarqa River with water. Amman’s position on the mountains near the Mediterranean climate zone places it under the semi-arid climate classification. Summers are mildly hot and breezy, however, one or two heat waves may occur during summer. Spring is brief and warm, where highs reach 28 °C (82 °F). Spring usually starts between April and May, and last about a month. Around the end of November is the period in which winter usually starts and continues from early to mid March. Temperatures are usually near or below 17 °C (63 °F), with snow occasionally falling once or twice a year. Rain averages about 300 mm (12 in) a year and periodic droughts are common, where most rain fall between October and April. At least 120 days of heavy fog per year is usual. Difference in elevation plays a major role in the different weather conditions experienced in the city, snow may accumulate in the western and northern parts of Amman (an average altitude of 1,000 m (3,300 ft) above sea level) while at the same time it could be raining at the city centre (elevation of 776 m (2,546 ft)).